On Monday night Liesel and I headed out to the theatre. We rarely have the opportunity to do so nowadays, having been up and working for 13hrs we had to pack up quickly in order to make the start of the performance. So what did we see? 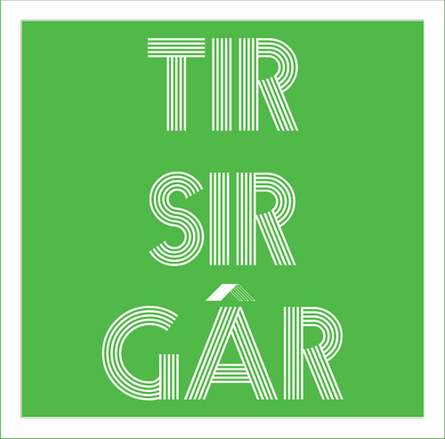 A new ‘promenade’ performance from Theatr Genedlaethol called Tir Sir Gar. I won’t divulge everything as it’s well worth attending, I know performances have sold well, so purchase your tickets asap. Saying that we went to the theatre is a little misleading. We didn’t attend a physical theatre in the traditional sense, but the mainstay of the acting performance took part in the varying rooms of Carmarthen County Museum. During our bus journey to the Museum, the shows ‘curator’ Marc Rees mentioned that there were two strands to the performance a fictional and factual one. The first, the fictional theatre piece tracked the life of a Carmarthenshire farming family, and the journey as the patriarch passes away and family deals with the experience. The performance was punctuated with installation pieces, film pieces and sculpture. But the narrative of the script is what really captured it for me. Post-performance, having been dropped back in Carmarthen by the bus, I sat in our van quietly for a few minutes. I’d barely spoken on the return bus journey, I’d found the play extremely powerful. In all honesty, I’d never experienced theatre or art in any form affect me quite so personally. It was as if art was imitating life. Mid experience, there was a scene around the farmhouse table about the future of the farm. I could feel an incredible rush of strong emotion as I re-lived my own past. At the age of 32, I’ve seen three of our family’s Carmarthenshire farms sold. My grandfather always said “they’re not making land anymore, so you should hold onto it”. I can’t say I relished the experience of having to re-live that time, and I know the play won’t have the same resonance for everyone, but I was so glad that someone else could write about it and share that experience with others. Although that was the fictional part, it felt pretty real for me. The true factual part related to the museum. It resides in the former Bishops Palace for the Diocese of St Davids. Its earliest records date to its foundation around 1283 as an Ecclesiastical College and it continued to serve the Diocese for well over six hundred years. A fire ravaged the building in 1903 but the house was renovated and it continued as a Bishops Palace until 1973. For some years now, the fate of many of the counties museums have hung in the balance and shrinking budgets have made local councillors question what the extent of the provision should be for the County. On arriving at the Palace, the signs of neglect were obvious. The fabric of the building requires work, decorative sandstone architrave can be seen crumbling, plasterwork is cracking and inside there are signs of water damage staining the walls of the exhibition rooms. When the local authority can afford to pump questionably large sums of money into commercial urban developments such as St Catherine’s Walk in Carmarthen and East Gate in Llanelli it does beg the question why some architectural gems are being left to rot. You might have seen a new photograph on my Twitter profile or on the Facebook page. Well, it’s thanks to Tir Sir Gar too. Although I’ve had press photographs done in the past, and I’ve worked behind differing types of cameras for many years, this is my very first ‘proper’ portrait. 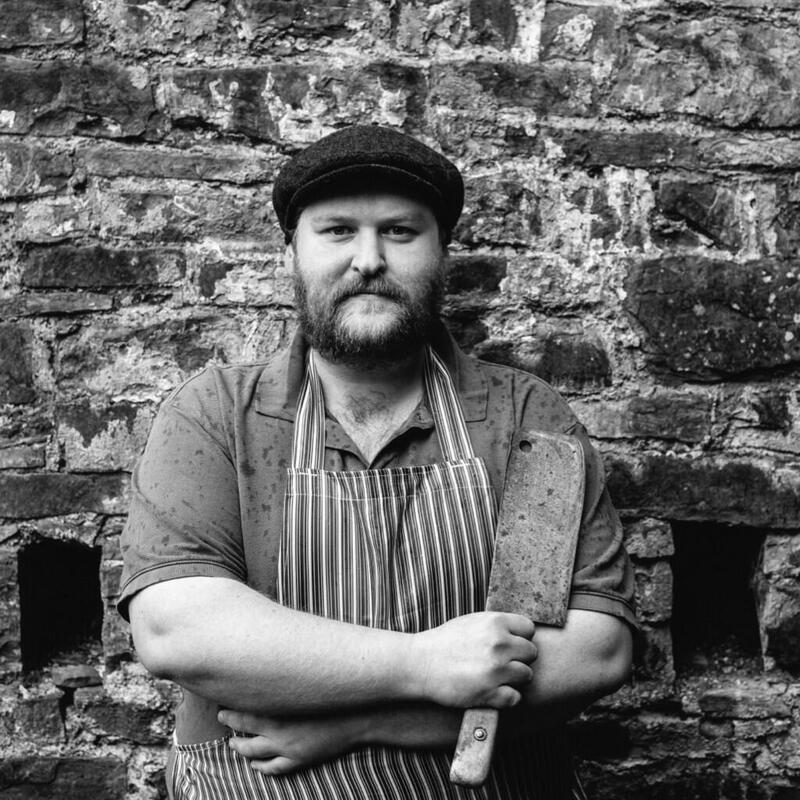 Twelve Carmarthenshire food producers were chosen to feature in a booklet to accompany the performance. Writer Jon Tregenna paid me a visit some weeks ago and wrote a very eloquent piece to accompany the photograph. Photographer Warren Orchard came too, and although he was here to take my picture we spent a happy few hours drinking coffee and discussing photography and film. Although my role has changed I’m glad I can still sometimes feel as if I’m part of something creative. I’m very fortunate to have worked in the creative industries, one of my proudest projects while working for the Wales Screen Commission was assisting with Dyddiau Du/Dark Days a piece produced by John Cale to represent Wales at the Venice Biennale. Many of my customers are artists too, I think they generally have an appreciation for good quality food. This last weekend we had a visit from Rose Davies and her husband Melvyn. Rose is an ardent scribbler and has a fantastic daily blog of her drawings. 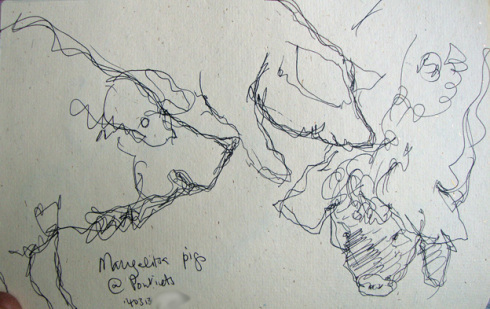 She ‘scribbled’ a fantastic set of drawings of our pigs, take a look at them here, here and here. Rose is heading Stateside in a few weeks time to attend a residency in Boise, Idaho. But there’s a chance to see some work closer to home. Rose is part of a collective called Commensalis, they’re currently running a crowd funding drive to fund an exhibition in Bath this summer. If you’ve got a few spare pounds and fancy an original print, head on over and donate. Images thanks to Warren Orchard, Theatr Genedlaethol and Rose Davies. Thanks for the pingbacks Illtud. I didn’t know you’d worked with John Cale. Kudos! A marvellous blog from Chaucutier, with the difficulties of maintaining a small farm in the present economic climate and loads of arty stuff as well. I haven’t seen the play but your grandfather’s words resonated with me, “they’re not making land anymore, so you should hold onto it”. My husband’s grandparents sold their dairy farm in Devon in the 1950s. Their only son didn’t want to take it on, preferring the better prospects (at the time) of doing agricultural drainage work. The two daughters, married and left the farm. Today both grandsons have returned to farming. My husband’s brother’s family has a dairy herd on rented land in North Devon and my husband and I managed to buy a small farm in Carmarthenshire. We’re not planning to let it go this time. Hoping to pass it on to the next generation.